Finally...the first objective way to see if your mattress really supports your spine properly. With this patent pending new technology, you can instantly check the support of your mattress in just seconds! 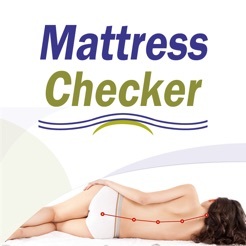 With the Mattress Checker app you can use your iphone, iPad or iTouch device to take a picture of someone on the mattress (you would need a mirror for a Selfie), then place 5 dots along the path of the spine from the bottom of the spine to the top and then let the app. 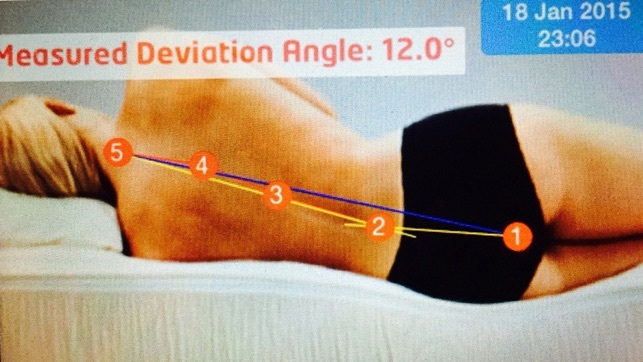 calculate your posture spinal alignment on the mattress. You can also compare one mattress to another or in the case of a mattress like the Air-Pedic, change the zone pressure to find the best spinal support settings. The mattress checker even stores your findings for comparison of your mattress to other mattresses you are looking to purchase, making the Mattress Checker the smartest way to shop for beds! You can even take advantage of our Free Consult and email one of our mattress experts the findings so that they can shed some light on why your mattress problem may be occurring and offer solutions for a better night's sleep! Added a timer functionality where users can use the timer to take the picture without the help of another person, and can get enough time to get into position for the automatic shot. © Dr. Rick Swartzburg, D.C.